Celebrate Buddha's Birthday by building a flowered pavilion together for the baby Buddha during the 6pm - 7pm hour. 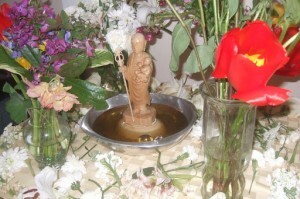 Then after meditation starting at 7pm we'll have a ceremonial washing of the baby Buddha together. As we process and chant a little dancing and music is in order - bring hand instruments: rattles, bells, little drums and such! Come celebrate! No need to register or RSVP. Just show up.